Asthma is a chronic or acute inflammation of tissue that causes the lungs and airways to swell. Common symptoms include coughing, wheezing, difficulty in breathing, and shortness of breath. 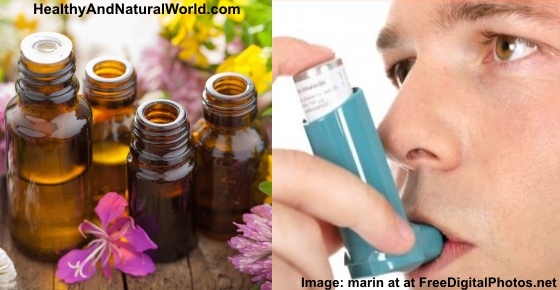 There are many natural treatments available to relieve asthma and in this article I am going to specifically describe how essential oils can help to relieve asthma. Essential oils may not always be an ideal treatment for asthma. After all, asthma attacks can be triggered by allergies, so those with allergic reactions to the scent of specific or all oils will have their attacks triggered by them. As a result, if you experience attacks or a deterioration in your breathing after using an essential oil, the better approach is to seek conventional medical advice. Almost no drugs work for everyone, and essential oils are no exception. Many sufferers may benefit from essential oils and use them to relieve the mild attacks, but still keep a prescribed inhaler on hand to deal with the severe cases. If you are sure you are not allergic to the scent of oils, this is probably an approach that you may want to consider, as it limits synthetic drugs to only the necessary cases. Essential oils and medications are not mutually exclusive, and the former can often support the systems of your body until the latter becomes necessary. Think of it as a complementary, rather than an alternative, treatment. Make sure to consult with your doctor before using essential oils for treating asthma. The bronchial passages, or bronchi, are the airways in the lungs that diverge from the main wind pipes. Asthma sufferers have extremely irritable bronchi that react negatively to a wide range of substances and circumstances, including second-hand smoke, pet fur, mold, dust, pollen, colds, respiratory viruses, and stress. These triggers cause the muscles around the bronchi to tighten and spasm, which limits the amount of air that can freely flow through them. The bronchi of asthma sufferers become inflamed, red, and swollen, which narrows them even further until there is not enough room for air to pass. In addition, the bronchial cells make more mucous, which narrow and irritate the bronchi and which even coughing battles to expel. Essential oils that help to control asthma either do so by relaxing the muscles around the bronchi so that air can flow freely, by relieving the inflammation and swelling that narrows the bronchi even further, or by hindering the production of excess mucous. General relaxants are also useful to calm the sufferer, which helps to facilitate slow, steady breathing. Another Chinese study tested the ethyl acetate extract from bergamot and found that, in addition to reducing mucous, it also reduced the number of inflamed cells in the bronchi and in the blood of mice.2 It, hence, seems to be a versatile intervention that addresses several of the causes of asthma. To secure the possible benefits, stick closely to the study. Boil a few drops of bergamot in a pot or steam inhaler and inhale the steam as many times a day as you feel it helps. Bergamot is also one of the best essential oils for treating depression and for weight loss. Eucalyptus is one of the best essential oils for allergy relief and it well established as an anti-inflammatory. Even though its anti-inflammatory properties have not been tested on asthma specifically, the relief that asthma sufferers experience from eucalyptus may well be due to its ability to reduce the swelling in the bronchi that makes breathing so difficult during an attack. It is also popular as a way to break up mucous which also makes as one of the best home remedies for sinus infection. Eucalyptus is also becoming well regarded as an antihistamine, as researchers have found that it blocks the release of histamines.3 Histamines are the compounds released by the immune system in response to things like pet fur, dust, mold, and so forth. Eucalyptus can, thus, serve as a useful anti-allergen to stop asthma before it gets going. If you are prone to asthma during any particular time of the year, put some eucalyptus oil in your diffuser (like this ZAQ Allay Litemist Aromatherapy Essential Oil Diffuser) and inhale as much of it as you can. It may fend off the mild and moderate attacks, which will still make most days a lot more pleasant. Peppermint is a very versatile essential oil and you can read my article about top 10 uses for peppermint essential oil. Once you have ensured that you are not allergic to the scent of peppermint oil, put some oil on a pad and inhale it directly. Oregano, sage, and thyme have all been found to be useful anti-inflammatories in both their powdered and oil forms.5 They work by both reducing the body’s production of pro-inflammatory compounds and by increasing its production of anti-inflammatory compounds. These are three tasty herbs to use in your cooking and to diffuse around your home. Many aromatherapists will agree with me when I say lavender (lavandula angustifolia) essential oil is the most versatile and commonly used essential oil on our planet. Lavender’s health benefits are unsurpassed among the essential oils. It is an anti-inflammatory to reduce the inflammation that coincides with an asthma attack. It is also a sedative and muscle relaxant to reduce the tension in the bronchial muscles. Since bronchial inflammation is best treated over time, you can diffuse lavender oil around your home throughout the season that you are most at risk of asthma attacks. When an attack strikes, inhale some lavender steam or some oil from a cloth directly to relax the bronchial muscles. Roman chamomile is one of the most popular natural interventions against asthma. Since researchers seem not to have studied it, the evidence is still anecdotal, but strong. Its relaxant effects, which also make it a good sleep aid, may be responsible for relaxing the bronchial muscles that narrow the airways during an asthma attack. If you have a warning that an asthma attack is on its way, put some Roman chamomile oil in your diffuser, lie down, relax, and inhale deeply. Tea tree oil is one of the most versatile and effective essential oils and it’s packed with a wide range of natural health benefits that puts it in a class of its own. I’ve already covered its many health benefits and I also wrote about the extraordinary uses of tea tree oil. Tea tree oil is popular as a breathing aid and is often used by bronchitis sufferers. It helps to expel mucous and thereby eases breathing and irritation in the lungs. Pour a few drops of tea tree oil on warm, damp face cloth. Breathe through it till the cloth becomes cool. Repeat the process a few more times till you feel better. Clove oil is popular in Southeast Asia as an asthma treatment. It is believed to have antispasmodic and antiviral properties. Accordingly, it can reduce the muscle tension during an asthma attack and fight the respiratory viruses that may cause them. To use clove essential oil, diffuse it in vaporizer or oil diffuser. You can also use clove oil as a chest rub. However, do not apply clove oil directly to your skin. Dilute it with a carrier oil such as jojoba oil or coconut oil to avoid skin irritation. A good approach is to blend oils that tackle all the causes behind asthma. You want a good anti-inflammatory, an antispasmodic, and an antihistamine blend. Eucalyptus is probably the strongest antihistamine on the list, so this will make the base of all your blends. will address all the causes of asthma and will relax you while the attack hits. Since both lavender and bergamot are both strong anti-inflammatories and antispasmodics, you can blend them both with eucalyptus, either together or separately, to make an effective contribution to your natural fight against asthma that may help you lessen the need to use conventional inhalers. You can get plenty of more information on how to use essential oils in my eBook Magical Aromatherapy. My eBook will help you to discover the most effective ways to use essential oils to unlock their immense healing power. 1. Shi, C.-c., et al., Therapeutic Effect of Bergamots Volatile Oil on Asthma. 《Journal of Applied Clinical Pediatrics, 2010. 04. 2. Yin, H.-p. and S.-m. Xu, Effect of ethy1 acetate extract from bergamot in asthmatic mouse model. Health Research, 2009. 02. 3. Ikawati, Z., S. Wahyuono, and K. Maeyamm, Screening of several Indonesian medicinal plants for their inhibitory effect on histamine release from RBL-2H3 cells. Journal of Ethnopharmacology, 2001. 75(2-3). 4. Tamaoki, J., et al., Effect of menthol vapour on airway hyperresponsiveness in patients with mild asthma. Respiratory Medicine, 1995. 89(7). 5. Mueller, M., S. Hobiger, and A. Jungbauer, Anti-inflammatory activity of extracts from fruits, herbs and spices. Food Chemistry, 2010. 122(4). 6. Ueno-Iio, T., et al., Lavender essential oil inhalation suppresses allergic airway inflammation and mucous cell hyperplasia in a murine model of asthma. Life Sciences. 108(2). The treatment for asthma with essential oils was very informative. I’m asmatic person and I’m forever digging to find out any & all that I can, to relax my breathing an naturally cleaning and repairing my lung. And Bless you and family this a LOVE STEAD MOMENT..